Feral cats cover over 99.8% of Australia's land area, including almost 80% of the area of our islands. These are just some of the findings of new research which looks at the number of feral cats in Australia. The research was undertaken by over 40 of Australia's top environmental scientists and brings together evidence from nearly 100 separate studies across the country. "Australia's total feral cat population fluctuates between 2.1 million when times are lean, up to 6.3 million when widespread rain results in plenty of available prey," said Dr Sarah Legge from The University of Queensland. The study also looked at what causes variation in cat densities. Cat densities are higher on islands, especially smaller islands. Inland areas with low rainfall and more open vegetation had higher cat densities than most coastal, wetter areas, but only after extensive rain. 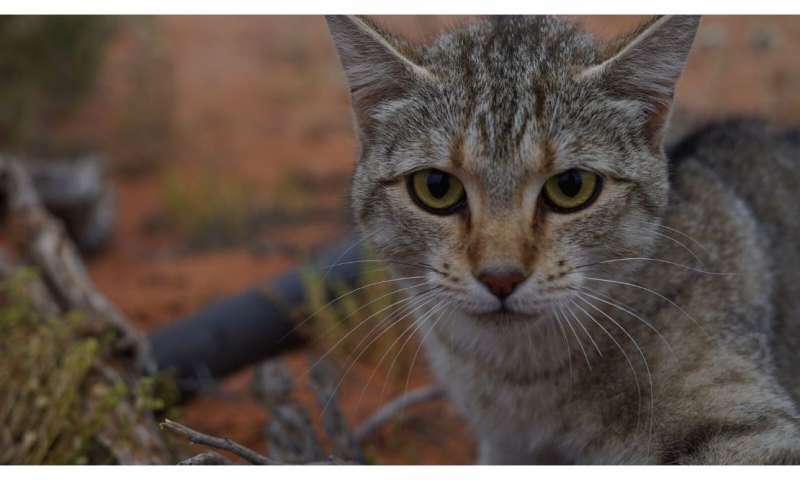 "Our study highlights the scale and impacts of feral cats and the urgent need to develop effective control methods, and to target our efforts in areas where that control will produce the biggest gains" says Dr Legge. "At the moment feral cats are undermining the efforts of conservation managers and threatened species recovery teams across Australia. "It is this difficulty which is pushing conservation managers into expensive, last resort conservation options like creating predator free fenced areas and establishing populations on predator-free islands. "These projects are essential for preventing extinctions, but they are not enough - they protect only a tiny fraction of Australia's land area, leaving feral cats to wreak havoc over the remaining 99.8% of the country." The research has been funded by the Australian Government's National Environmental Science Programme and will be important to developing effective strategies for controlling cats and their impacts. "This new science shows that the density of feral cats in Australia is lower than it is in North America and Europe, and yet feral cats have been devastating for our wildlife," said Mr Gregory Andrews, Australia's Threatened Species Commissioner. "Australia is the only continent on Earth other than Antarctica where the animals evolved without cats, which is a reason our wildlife is so vulnerable to them. This reinforces the need to cull feral cats humanely and effectively. "With feral cats having already driven at least 20 Australian mammals to extinction, I'm so glad the Threatened Species Strategy is investing in science like this. "This science reaffirms the importance of the ambitious targets to cull feral cats that I am implementing with the support of Minister Frydenberg under the Threatened Species Strategy," said Mr Andrews. According to Dr Legge, "As well as strategically targeting areas for cat control in bushland to maximise the conservation outcomes, we also need to address the issue of feral cats living in heavily urbanised areas, where their densities can be 30 times greater than in natural environments. "As well as preying on the threatened species that occur in and near urban areas, these urban feral cats may provide a source of feral cats to bushland areas." The research has been published in the research journal Biological Conservation.